Permanent renal damage following extracorporeal shock wave lithotripsy (ESWL†) of renal calculi has not been reported. However, several studies have shown that temporary acute functional and morphologic changes can be noted immediately after ESWL treatment. 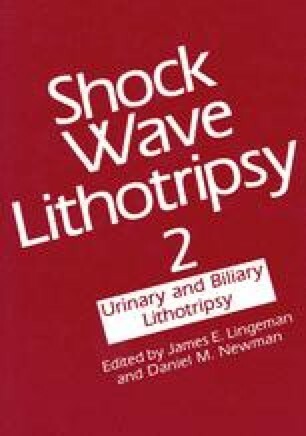 Shock wave therapy has been directly associated with the development of intrarenal hematomas, interstitial edema, and temporary tubular dysfunction. The occurrence of reversible acute tubular necrosis following bilateral, simultaneous ESWL therapy in a nonobstructive system is herein reported.